20 year old Calum McWilliam of East Kilbride AC broke the tape in a close fought finish to claim the mantle of winner of the 149th New Year Sprint, as well as the gold medal and four thousand pound first prize. 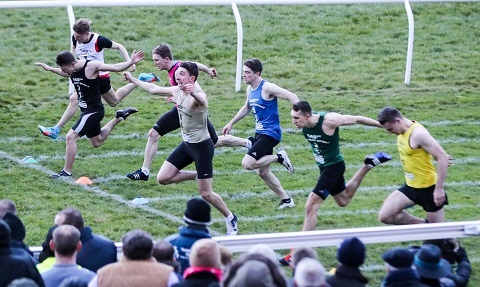 The final and cross-ties were was held on Monday 1st January 2018 at Mussleburgh Racecourse near Edinburgh with the heats held at the East Lothian Athletics Arena in Prestonpans on 30th December 2017. 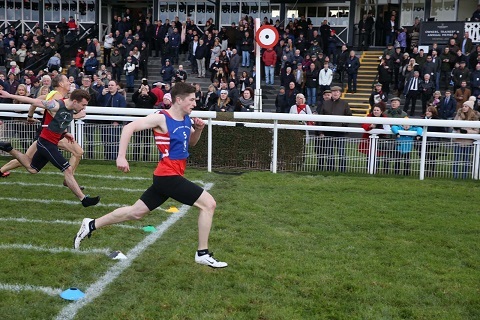 Calum, running off 9.75m, emerged as the fastest winner of the cross-ties, where he showed great strength in regaining the lead from Ryan Houten of Peebles (8.25m) in the final few strides of the race. Nevertheless, Calum started the final as second favourite at 7/2, while was Ryan was favourite at evens. Both Calum and Ryan were attempting to make it third time lucky to win the Sprint with Calum finishing 5th in both 2015 and 2016 and Ryan second in both 2015 and 2016. Ryan finished in third place in this year's final - no doubt a big disappointment for him, but nevertheless a marvellous sequence of placings. Last year's winner Greg Kelly, a clubmate of Calum's, made an admirable effort to retain his title, finishing a creditable fourth place. No runner has successfully defended the title since Willie McFarlane of Glasgow in 1934. Gordon Bury, as coach to both Calum and Greg, celebrated his second New Year Sprint victory in succession. As a result of a glitch in the photo-finish equipment, only the winner's time was available. The final proved to be a very close affair with just 2 metres separating 1st and 7th places. Calum's finishing strength proved decisive as he held on to his slender lead, edging out William Hutchison of Lasswade AC (11m) by inches with Ryan Houten on his shoulder in third. Backmarker Greg Kelly (green bib), running off 5m, powered into 4th place just inches back. Alexander Young (blue bib) of Larkhall (9m), nicked fifth place from Keiran Reilly (pink bib) of Lasswade AC (10m), running in his fifth New Year Sprint final, with Kyle Potts (white bib) of Hawick (12m) just edged out into seventh place. Max Leslie of Edinburgh AC (10.5m), who was fresh out of the Youths, having celebrated his birthday in October, was eighth. Max, Alexander and Kyle were all making their debuts in the New Year Sprint. Times in the final were generally a couple of metres slower than in the cross-ties due to a cold headwind picking up following a downpour spoiling what had been a still, dry and relatively mild day. The first cross-tie featured William Hutchison, the fastest heat winner in 11.22 secs. William was edged out by 2017 winner Greg Kelly in 11.63 secs but qualified for the final as a fastest looser. Steven Park of Edinburgh (10m) was 2 metres back in third with veterans Dougie Donald of Oakham (18.75m) - the winner back in 1991 - in fourth and Cameron Smith of Central AC (14m) in fifth. Alexander Young won the second cross-tie in 11.57 secs - remarkably the same time as he ran in his heat on the quick, synthetic surface at the East Lothian Athletics Arena. 2 metres back in second place was Sandy Wilson of Hawick (8.25m) whose cross-tie time was half a second slower than the time set when winning his heat. Half a metre back in third place was veteran Graeme Armstrong of Edinburgh (21.5m). Another two metres back was Oliver Wagner of Ecclefechan (9.75m) in fourth, just ahead of Megan Busby-Bell of Carlisle Aspatria (21.5m). The third cross-tie generated a thrilling finish with the first 3 runners finishing within half a metre. Keiran Reilly, winner of the third fastest heat, took the tape in 11.70 secs with Max Leslie edging our Cameron Caldwell by a hundredth of a second. It was a big hundredth of a second for Cameron, though, as it saw him fail to reach the final. Strangely, Max also beat Cameron by a hundredth of a second in their heat. Rianna Sterricks of Leithenburn AC (22.5m) was 3 metres back in fourth place with Stacey Downie of Edinburgh AC (18m) 2.5 metres adrift in fifth. The fourth and last cross-tie saw Ryan Houten, one of the long odds favourites and winner of the fourth fastest heat, in action. With 15 metres to go Houten had edged passed McWilliam to take the lead, only for McWilliam to find another gear and sneak passed Houten just before the finish - a dramatic maneuver rarely seen at this level. 2 metres behind saw Kyle Potts come in 3rd, claiming a fastest loosers spot for the final. Another 2 metres back was Ryan Clydesdale of East Kilbride (10m) and a further 2 metres behind saw Christie Rout of TLJT (23.5m). All the events supporting the New Year Sprint were held on the first day of proceedings on the tartan track of East Lothian Athletics Arena in Prestonpans. Conditions were relatively kind for most of the day with no rain and little wind though it was decidedly chilly. However, a strong cross wind started up in time for the 90 metres cross-ties but the rain held off until after the close of events. In the first final of the day, the 800 metres Open, second backmarker Fraser Neil of Kelso (70m) made a late bid for victory, passing Matthew Fleming of Kelso (110m) with just 20m to go and winning in 1 min 52.60 secs. Dean Whiteford of Innerleithen (85m) followed 3 metres behind Matthew with Georgina Morrison of Inverclyde AC (160m) in fourth place. Veteran Albert Eland of Broughton (215m) - the winner an astonishing 34 years ago - led up to the start of the home straight but faded to fifth. In the 90 metres Youths, Maddison Murdoch of Larkhall YMCA (21.5m) just overhauled frontmarker Louis Whyte of Leithenburn AC (23.5m) to win in 9.85 secs with second backmarker Finn Douglas of TLJT (9m) storming up the track to claim 3rd place a metre behind. Harris Morrison of Inverclyde (21m), who had posted the fastest heat time, was a metre back in fifth with Katie Dunwoodie of Shetland AC (14m) sixth. This victory demonstrated Maddison's versatility as she won the 800 metres Youths event a couple of years before. Skye Marshall won the 800 metres Youths in the fast time of 1 min 50.80 secs finishing a full 10 metres in front of Harris Morrison of Inverclyde AC (175m) who led home Hannah Steel of Lothian RC (180m) by 5 metres. Matty Fleming of Kelso (235m) was fourth followed by Craig Angus of Moorfoot AC (65m) in fifth place. 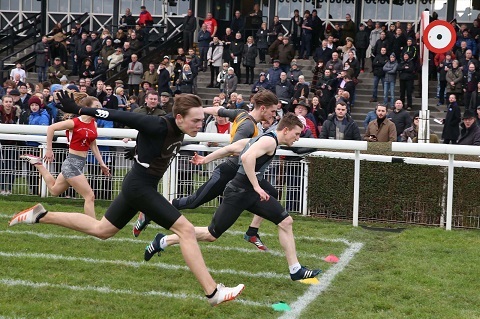 Malcolm McPhail of Ayr (15m) enjoyed his first success in the Veterans 90 metres (also the first cross-tie of the 90 metres Open) where he narrowly won the final in 9.65 secs from Cameron Smith of Central AC (12m) with Paul Donaghy of Durham City (14m) a metre back in third with Dougie Donald of Oakham (15m) hot on his heels in fourth. Megan Busby-Bell of Carlisle Aspatria (19m) celebrated her debut at the New Year Sprint meeting by winning the final of the Ladies 90 metres convincingly in 9.63 secs (also the second cross-tie of the 90 metres Open). Last year's winner winner Stacey Downie of Edinburgh AC (14.5m) just overcome the challenges of Rianna Sterricks of Leithenburn AC (18.5m) in third place and Philippa Robertson of Hawick (18m) in fourth. Harris Morrison of Inverclyde AC (38m) completed a busy day by winning the Youths 200 metres aged under 13 by a clear margin. Harris had previously finished fourth in the Youths 90 metres and second in the Youths 800 metres. Second was Maddison Murdoch (36m), running off a reduced start having won the Youths 90 metres earlier with Louis Whyte (38m) third and Stevan Nightingale of Leithenburn AC (35m) a metre back in fourth. In the older category of Youths 200 metres, second backmarker Calum Holmes of Edinburgh AC (7m) stormed through the field to win comfortably in 23.37 secs from Finn Douglas (13m) who narrowly held off Ben Lyall of Kelso (7m) with backmarker Sol Stewart of VP Glasgow (4m) - last year's Youths 90 metres winner - in fourth place. The last event of the day is generally the final of the 90 metres Open - supposedly the consolation event for the Big Sprint competitors - but nevertheless an occasion which is awaited with great anticipation. 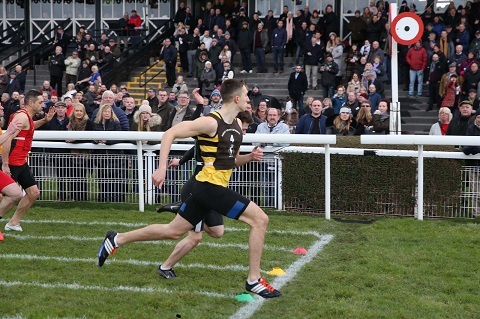 Unusually, the winner of the fastest heat of the Big Sprint, William Hutchison, also took part in this "consolation event" and not suprisingly reached the final having posted the fastest time. He was joined by other qualifiers for the Big Sprint cross-ties: Megan Busby-Bell, Cameron Smith and Max Leslie. Megan, the frontmarker appeared to be heading for her second title of the day but was just beaten to the line by William in his final two strides. Mark McLachan of Inverclyde AC (11.25m) followed in William's wake pushing Megan back into third place. 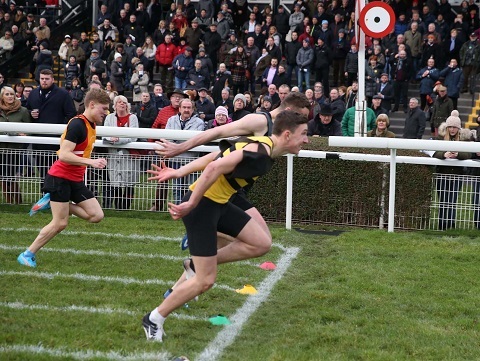 2 metres behind, Malcolm McPhail was given the verdict for fourth place over Max Leslie who shared the same time, though Max had been penalised a metre for a false start. Cameron Smith was a metre back in sixth place.